He criticized the UK government for having shown indifference to his fate and that of fellow British captives who have been killed by ISIS. “The British government was entirely happy to watch as an 81-year-old man made a film asking for my release from his hospital bed, then die because he didn't want to see his youngest son executed. That was my dad,” Cantlie continues, referring to his late father, who died of complications following pneumonia in 2014. He said he holds the government partially responsible for the death of his father shortly after appealing to his son's captors to set him free. The 83-page magazine also features gruesome images of Islamic State’s latest atrocities, including the killing of Jordanian pilot Lieutenant Muadh al-Kasasbeh, who was burned to death in a metal cage, and profiles Amedy Coulibaly, who killed five people in an attack at a kosher grocery store in Paris last month. 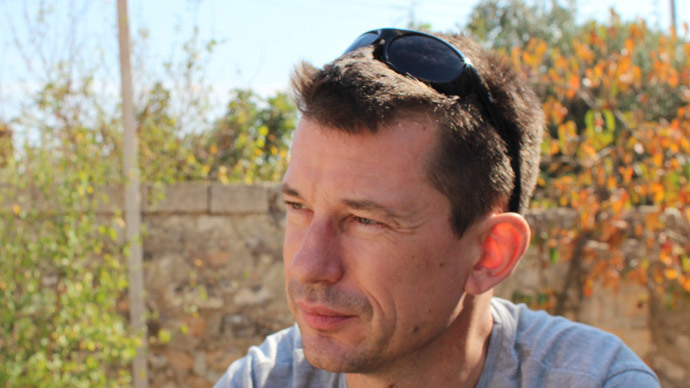 Cantlie was kidnapped in Syria in 2013 and has since appeared in several ISIS videos, which purportedly aim to explain the group’s mission and the situation in Syria. He also seems to criticize Western air strikes against ISIS, saying: “Every bomb dropped in Syria or Iraq serves as a recruitment tool for the Islamic State.” However, it is impossible to verify whether Cantlie definitely wrote the article and which parts have been edited by ISIS propagandists. Cantlie also partly blamed the media for his situation, saying news outlets have failed to ask more pressing questions about the government’s role in the failure to free the hostages. “In many reports there's little commentary or analysis, just ‘Cantlie does another film and talks about this and that,’” he adds. The photojournalist says he accepted the role of the militant group’s media representative and reporter in order to survive. Cantlie, 44, has been held hostage alongside fellow British captives David Haines and Alan Henning. He was also held with Americans James Foley, Steven Sotloff and Peter Kassig, all of whom have been murdered by the jihadists. US aid worker Kayla Mueller has also reportedly been killed while held hostage by ISIS. “Thank you so much for your tireless efforts,” Cantlie’s article reads. “But let it go. Leave it be and get on with your lives, all of you,” he tells his family, fiancée and friends. Dabiq also claims to have interviewed Hayat Boumedienne, the widow of Paris gunman Coulibaly, suggesting she now lives in the self-proclaimed caliphate. “Living in a land where the law of Allah is implemented is something great,” the 26-year-old reportedly said.